Diver-Suite from Van Essen Instruments provides a robust line of Diver dataloggers for groundwater and environmental professionals. The Diver dataloggers accurately measure and record fluctuations in surface and groundwater levels, temperature and conductivity. 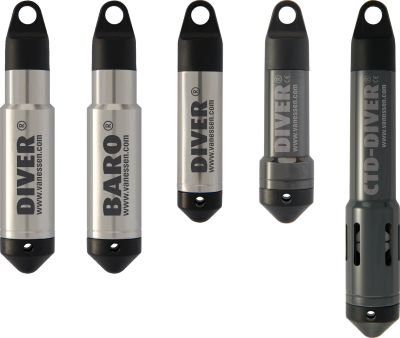 From the technologically advanced TD-Diver to the corrosion resistant CTD-Diver, Diver dataloggers are hermetically sealed to external influences and can be used for groundwater, surface water, and coastal waters applications. Electrical and/or environmental effects cannot affect the measurement results. With an extended battery life up to 10 years, this translates to long-term uninterrupted service. Divers can be used from 300 meters below to 5,000 meters above sea level without the need to reprogram the datalogger. Van Essen Instruments offers a complete portfolio with regards to technology as well as advice in the field of groundwater monitoring networks. Reliable and accurate sensors are being combined with the latest developments in the field of wireless communication and data visualization. Van Essen Instruments not only offers high-quality groundwater data but also solutions to manage a groundwater monitoring network more effective and efficient.